The National Highway Traffic Safety Administration has recently adopted a tougher scoring system for their annual crash test safety rating and the 2015 Ford F150 has used this new method to show us that even with a lightweight new body, this half ton pickup is safer than the outgoing model. The NHTSA recently published their results for the 2015 Ford F150 SuperCrew and while the aluminum bodied pickup didn’t score 5 stars in every single metric – it did improve everywhere there was room for improvement while also receiving a 5-star overall score. The National Highway Traffic Safety Administration safety ratings are based on a variety of different tests, all of which factor into the overall score. The three types of impacts are Front Crash, Side Impact and Rollover and there are breakdowns for driver and passenger in each of the first two, along with a chance of rollover percentage for the final figure. The new F150 scored 5 stars in Front and Side, 4 stars in Rollover and an Overall safety rating of 5 stars. Most importantly, the new F150 has improved a great deal over the prior generation, even though this new truck is considerably lighter. I looked up the NHTSA crash test safety rating pages for the 2014 and 201 Ford F150 with rear wheel drive and the SuperCrew cab configuration. 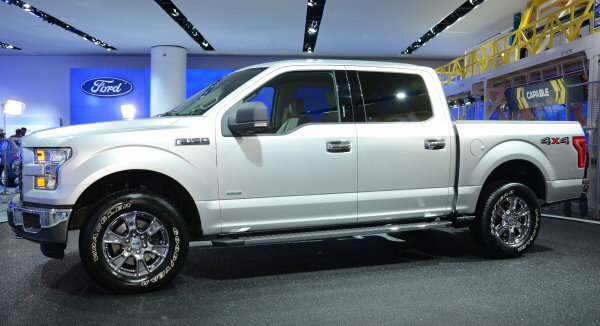 The 2014 F150 weighed 5,680lbs while the 2015 F150 as tested by the feds weighed just 5,060lbs. Could a truck that is 620lbs lighter be as safe? In Front Crash, the 2015 F150 SuperCrew scored 5 stars with additional 5-star ratings for both the driver and passenger while the 2014 F150 with the steel body scored 3 stars for Front Crash, with a 4-star rating for the driver and 3-star score for the passenger. During the Side Impact portion, the 2015 F150 scored 5 stars in side crash and side barrier with 5-star ratings for both the driver and passenger during side crash testing. The new F150 also scored a 5-star rating in Side Pole impacts and 5-star combined side impact ratings for both the front and rear seats. The 2014 F150 scored the same perfect 5-star ratings in every side impact category as well, so the 2015 didn’t get better – but only because the older models were already at the top of the scale. Finally, during the rollover testing, the 2015 Ford F150 SuperCrew scored just 4 stars, just like the 2014 F150 SuperCrew. While the new model didn’t technically improve in its rollover rating, the risk of rollover for the 2014 F150 was 19.8% while the risk of rollover for the lightweight 2015 F150 improved to just 19.1%. So, outside of the rollover score that is inherently impossible for a high riding truck to ace, the 2015 Ford F150 really did as well as the team could have hoped. Even with the lightweight aluminum body, the new F150 is safer than the outgoing models and it is as safe as any other large truck, matching the 2015 Chevrolet Silverado with 5-star scores in every category shy of rollover.